BANGI, 5 Dec 2013 – Students from 15 countries studying at The National University of Malaysia took part in the 5th International Food Festival here today, showcasing their respective cuisines and cultures. 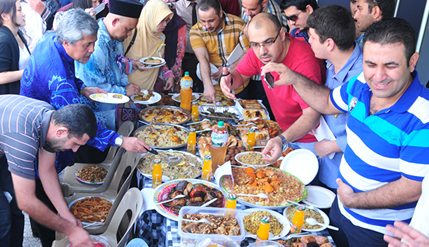 The students from Afghanistan, China, Indonesia, India, Iran, Iraq, Malaysia, Palestine, Thailand, Jordan, Syria, Sri Lanka, Turkey and Yemen offered their delicacies while explaining the origins of their foods to visitors. Festival Director Assoc Prof Dr Fazilah Idris said it is aimed at fostering closer ties between the local and international students of the university. Dr Fazilah has been its director since its inception in 2009. This year would be her last as she will be going for her sabbatical. Organised by the Malay Language Course Committee of the Centre for General Studies, it was officially launched by Director of the Centre, Prof Dr Khairul Anwar Mastor. Visitors found similarities between the offerings of the nations of the Levant, West Asia, Turkey and Uzbekistan, while the Indonesian students painstakingly divided their counters between the cuisines of Aceh, West Java, Sunda and Kalimantan. One of the most visited stalls was Jordan’s where the students prepared traditional cakes and cooked Lamb Pulo Rice. Among other delicacies of Jordan offered were Kapsa or Chicken Rice, Tabilla or chopped mixed vegetables and Magrubah, a cake made ​​of cheese. The Food Festival helped foreign students introduce their traditional foods of various kinds and flavors and at the same time allowed them to demonstrate the preparation of their cuisine. They were also given the opportunity to relate the various places of interest in their countries to visitors. Various activities were held throughout the exhibition including, briefings on each nation and traditional dances, singing and poetry readings. There were also demonstrations of cookery by some of the participants and contests for best stalls, best exhibitions and best costume. The first prize for best stall went to Indonesia with Jordan finishing second and Iran third. The top prize for best exhibition went to Jordan, which had several of its participants in Bedouin garb. Afghanistan also had some of its students in national dress winning the second prize. Iraq, with its familiar Arab jelabiyya and Topf attire came out third. There was also a category for the “most happening” stall, which meant the students there were the most active. First prize was won by Iraq, Bangladesh was second with Sri Lanka third.